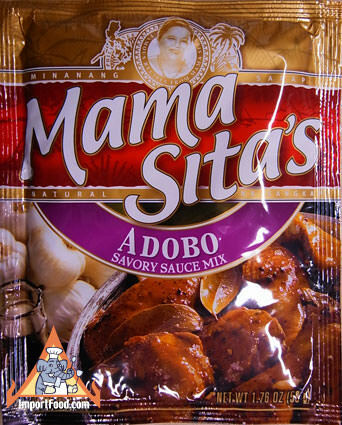 New arrival fresh pack spice made by well-known high quality producer Mama Sita's of The Philippines. The package states "This garlicky concoction of spices serves as a perfect base for authentic Filipino adobe." Instructions on the package: dissolve in 1 cup water, pour mixture over meat cut into cubes. Marinate for 15 minutes. Remove meat from marinade and pay fry in hot oil until edges turn golden brown. Pour in the marinade and bring to a boil. Lower the heat and simmer until meat is tender and sauce has thickened. Add water, as needed. A nice foil envelope, 1.76 oz. Makes 8-10 servings. Ingredients: garlic powder, cane sugar, salt, msg, caramel color and spices. Product of the Philippines.